As you may or may not know, I have had a whole string of teenage girls working for me over the past few years, mostly as students. Some have been better than others. One I remember told me that "I have a bit of an attitude sometimes" to which I replied "not when you are working for me you don't". She left a few days later. Another was playing me up so badly when I was meant to be giving her extra tuition that I sent her into the office to wait for her mother telling her not to speak to her "elders and betters" like that. She never came back. Others have been lovely, and have great things ahead of them. I am pleased to say that the latest incumbent, Miss Chloe Gray is of the latter school. Dear Chloe was here yesterday and toiled massively. 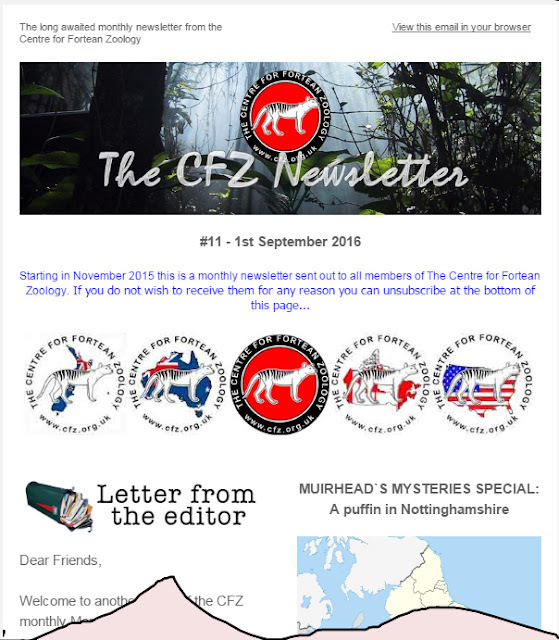 Together we put together the latest CFZ Newsletter and sorted both hard copy and ebook versions of the last two issues of A&M - something we should have done weeks ago. She shows a real aptitude for what we do and is truly the best assistant that I have ever had. In this issue we say goodbye to a gracious and very talented lady: Gilli Smyth of Gong. Doug goes to see Brian Ferry, Alan goes to see what the British Library has to say about Punk, and explains Futurology and Free Cultural Spaces, while Jon waffles on about stuff. Most scientific experts agree that data from the initial trial badger culling areas in Gloucestershire, Somerset and Dorset do not justify further extension of culling (Scientists criticise badger cull extension, 31 August). In ignoring this advice, and extending culling to five new areas, the government risks not only wasting much money but also giving farmers false hope that the approach will contribute to reducing TB in cattle. The initial trial areas were set up to test whether free-range shooting could be done humanely and at the same time reduce badger populations by at least 70% – the figure previously established as the level needed to achieve a significant reduction in TB in cattle. Non-achievement of culling targets not only risks the whole exercise being futile but might actually increase the infection rate in cattle due to the wider ranging of surviving badgers within the culling areas. Bovine TB has been declining since the introduction of stricter pre-movement testing of cattle in 2007-08, so it is difficult to tell what effect the culling is having on disease incidence within and around the culling areas. Nevertheless, contrary to anecdotal evidence from farmers, the only detailed analysis published so far showed no significant effect over the first two years. An honest government would admit that the culling methodology doesn’t work and abandon it altogether. Failing this, an alternative would be to complete the initially planned four years of culling in the existing areas, basing targets on the most realistic population estimates, and then to follow up with a detailed analysis of the results before deciding whether to extend or discontinue culling. This Bigfoot Documentary Looks Great! From youtuber Trace Unknown - Quest for Bigfoot: An Unknown Species. Filming for the first season has now been completed. Editing in process. AVAILABLE FOR DOWNLOAD SEPTEMBER 7th!! A short clip from my upcoming Bigfoot documentary WILDMAN: MY SEARCH FOR SASQUATCH. For those of you not in the know, at the beginning of each month we send out a newsletter to all members of the CFZ. The most recent (which went out yesterday) included articles on puffins in Northamptonshire, The 2016 Weird Weekend, the return of OTT, vagrant butterflies in the UK, Notes and Queries etc. ON THIS DAY IN - 1859 - The Pullman sleeping car was placed into service.